Dog Bone Sign with Dog's Name - - is a perfect holiday gift for your own dog and all the other dogs on your gift list. This Comfort House exclusive is custom made just for you. Made in USA. Fast turnaround; ships in 1-2 days. One-of-a-kind personalized dog bone shape sign is a novel and affordable gift for that special dog and his or her owner. 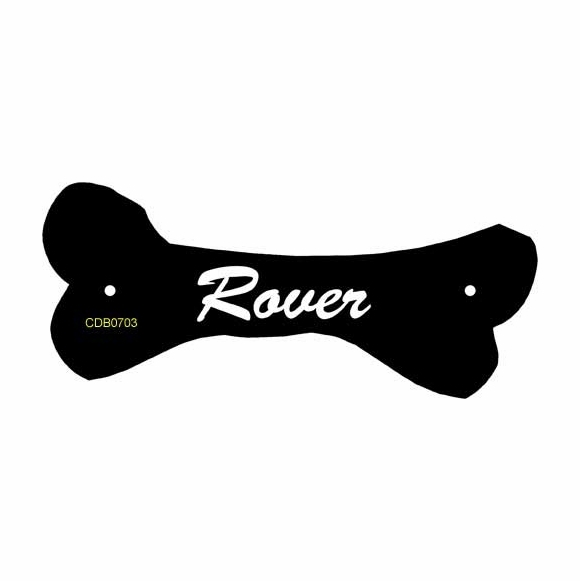 Ready to hang on the wall near Rover's food dish, bed, or favorite chair or above the dog house door. Can also be attached to our optional 24" lawn stake Comfort House # CGS24001. Made from sturdy and UV-stabilized, non rusting acrylic. Permanently engraved with one line of personalization. Holds up to eight (8) 0.75" high characters or up to twelve (12) 0.5" characters. Note: style number shown in the sample is not printed on your dog. Dimensions (approximate): 7"W x 3"H at the ends/1.5"H in the middle. Dog Bone Sign with Dog's Name makes the perfect holiday gift for your own dog and all the other dogs on your gift list. Custom made just for you. Made in USA.